Test circuit to display the count from a rotary encoder on a seven-segment display. I've also included an example program showing how to use the routine on an Arduino Uno. Rotary encoders let you control an analogue value by rotating a knob. They generate a series of digital pulses reflecting the distance you've turned the knob, and you can also determine the direction it has been turned. Some of the rotary encoders have click positions, or detents. The routine described here gives two pulses per click position, so you may prefer to divide the count by two if you are using one of these encoders. My favourite rotary encoder is the one from Bourns. It has a very smooth but precise action, with no detents, and Bourns makes matching potentiometers in an identical housing. It's quite hard to find knobs that fit some of these encoders. In particular, the Sparkfun encoder has a very short shaft, so many knobs will be too deep. The Bourns Rotary Encoder has a 3.2mm shaft diameter, which is smaller than the usual 0.25" shaft. This is not a problem with the Adafruit rotary encoder, which includes a matching knob. Rotary encoders work by providing two switches that are activated in sequence when you rotate the knob. They are usually called A and B, and there's a third common terminal C that is typically connected to ground. By checking the state of both switches your program can tell both how far the knob has been rotated, and in which direction. At each changeover the switches generate an unpredictable amount of contact bounce, which is unavoidable because of the mechanical construction of the switch contacts. Clearly, simply counting the transitions is going to give an incorrect count. Rotating the encoder through a given angle, such as one turn, should produce the same change in value. The change in value should be the same whether you turn the encoder slowly, or spin it as quickly as possible. Turning the knob through several turns, and then back to its original position, should return the value to its exact starting value. These requirements are all really equivalent, and depend on eliminating the effect of contact-bounce in the switches. This gives us in C a cleaned-up version of A, free from any contact bounce. At each transition we then compare the state of the cleaned-up signal C with its previous state. If it has changed, a transition has occurred in C, and we count it as a valid count. When a valid count is detected the routine calls ChangeValue() with a boolean parameter to indicate the direction of the count. 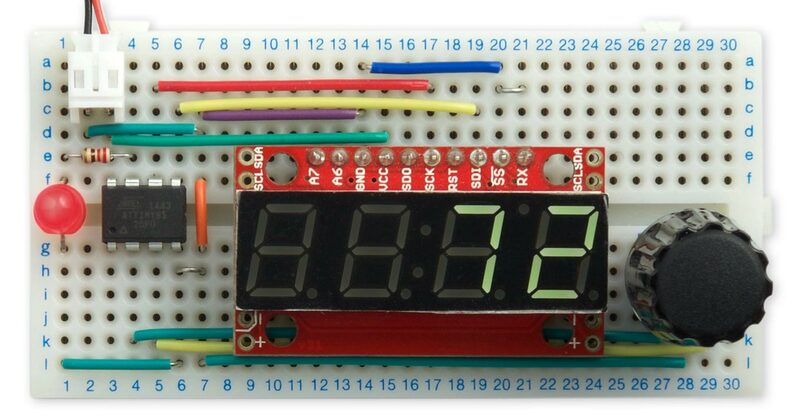 Demo rotary encoder interface displays the direction on an LED and the count on a seven-segment display. I compiled the program using Spence Konde's ATTiny Core . Choose the ATtiny25/45/85 option under the ATtinyCore heading on the Board menu. Then choose Timer 1 Clock: CPU, B.O.D. Disabled, ATtiny85, 1 MHz (internal) from the subsequent menus; this is the default fuse setting on a new ATTiny85. Then choose Upload to upload the program using ISP (in-system programming); I used the Sparkfun Tiny AVR Programmer . Here's the whole Bounce-Free Rotary Encoder program: Bounce-Free Rotary Encoder Program. ^ Rotary encoder + extras on Adafruit. ^ EC11 Rotary Encoder Audio Digital Potentiometer on Aliexpress. ^ 3315Y-001-016L - Incremental Rotary Encoder on Farnell.